Earlier this week Scottish Police Authority (SPA) papers revealed the £56.2m gap between the police's proposed capital spending and the funding from the Scottish government this year. The party's justice spokesman Liam McArthur said: "Staff at every level of the national force have raised concerns about serious budget pressures. "The fact that they are carrying out their duties in vehicles approaching 200,000 miles on the clock is just another symptom of the pressure that Police Scotland is under." 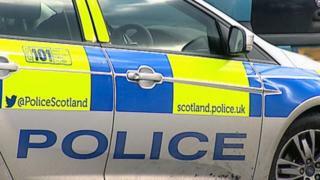 The budget proposal said: "Police Scotland will ensure that the fleet continues to meet its 95% availability target, however vehicles will be replaced less frequently with the result that the fleet has to spend more time off the road undergoing (more expensive) repairs and incur higher fuel costs." Andrea MacDonald,chairwoman of the SPF, which represents rank and file officers, told the conference the fleet was a "disgrace", with "inadequate" police patrol cars "held together with duct tape". Chief Constable Iain Livingstone said: "Our maintenance team do an excellent job and we have over 96% of the fleet on the road. "Across a multitude of demands, we are prioritising the capital budget we have been allocated and are investing in the right areas to achieve as much as we can, as quickly as we can. "Police Scotland requires significant capital funding to address historic under-investment in policing. "Our challenge is to make the case to the Scottish Police Authority and the Scottish government that the investment needed to build a sustainable service will improve the lives of our citizens." A spokesman for Justice Secretary Humza Yousaf said Scottish government funding would increase in the coming financial year. He said: "More hypocrisy from the Lib Dems - as they voted against a 52% capital uplift for police in the Scottish budget. "While the allocation of resources is for the Chief Constable and SPA to determine, we are protecting the police resource budget in real terms in every year of the current Parliament, delivering a boost of £100m by 2021." The spokesman said total Scottish government funding for the SPA in 2019-20 would increase by £42.3m, bringing the annual policing budget to more than £1.2bn. "This includes a 52% increase to the capital budget - providing £12m more - which will fund essential investment in IT infrastructure and support mobile working for officers, allowing them to access information remotely and spend more time in communities. "We continue to press the UK government for a refund of the £125m paid by Police Scotland in VAT between 2013 and 2018."